I’ve made mini pizzas on English muffins and even whipped up a batch of Pizza Muffins. I had not tried Pizza Wontons until recently and we are new fans! I love the crisp wontons you get at the Chinese buffet. I always load my plate up with a bunch. They aren’t the healthiest, but they sure taste good. Look for wonton wrappers in the produce section in your grocery store. They are refrigerated and should be near the egg roll wrappers. No shocker there! You’ll be able to make lots of wonton cups from one package. I used a little less than half a package for this recipe. 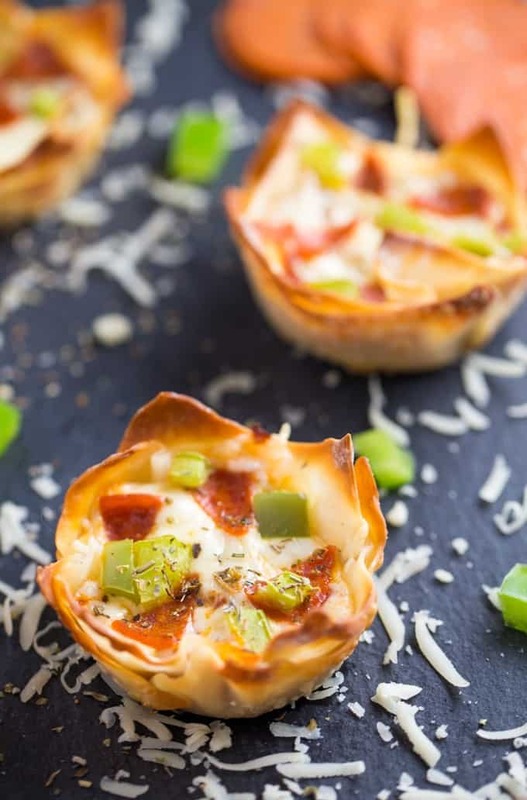 After you’ve lined your muffin tin in the wonton wrappers, add your favourite pizza toppings. I kept mine pretty basic – pepperoni, green pepper, pizza sauce and cheese. These tasty appetizers are perfect for a game night or movie night. I’ve even served them for dinner paired with a Caesar salad. The kids gobble them up! I love how easy they are to make and that you can change up the toppings to create a totally different pizza recipe. Visit my Pizza Pinterest board for more inspiration. You’ll find a ton of ideas for different kinds of pizzas to try and make with wonton wrappers. 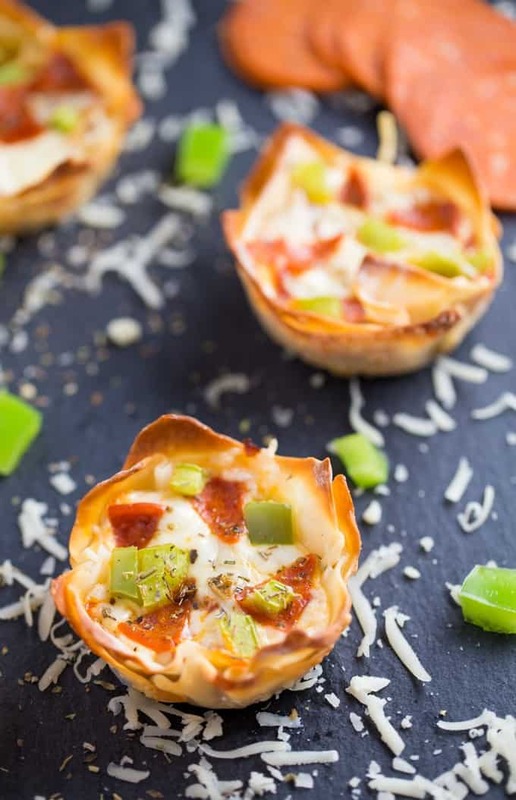 What toppings will you use in your Pizza Wonton Cups? You might also like these Pizza Rolls. 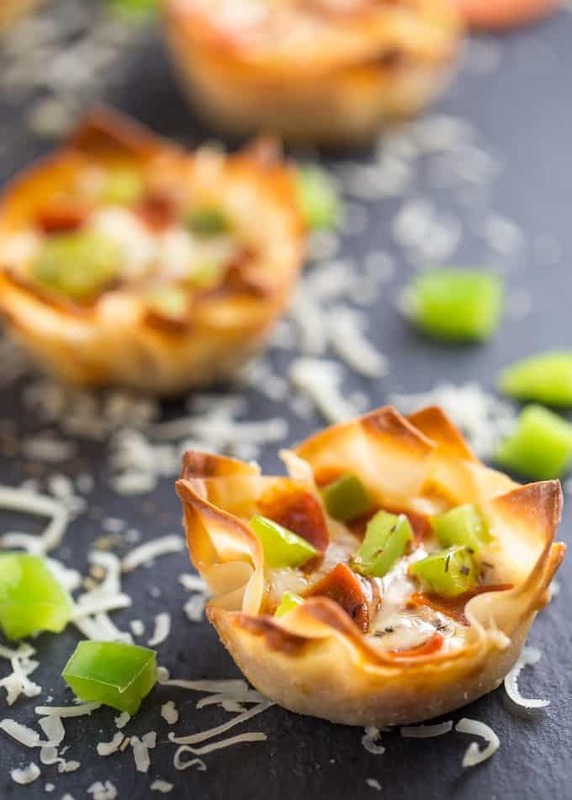 An easy appetizer baked in a crispy wonton shell and full of cheesy pizza goodness. Try them once and they may become an instant family favourite! Preheat oven to 375F. Spray a muffin pan with cooking spray. Line each muffin cup with a two wonton wrappers each. Add 1 tsp pizza sauce to each wonton cup. Top with 1 to 2 tsp of mozzarella cheese, pepperoni slices and green peppers. Sprinkle a pinch of Italian seasoning on top. Bake for 15 minutes or until cheese is melted and wontons are golden brown. Serve hot. What a great idea – sounds like something my kids can take in their lunchbox. I am pretty sure my family would devour these! What a fun idea, sounds delicious! They look so yummy & very fast and easy to make, thanks! What a great idea! The perfect appetizer, and it looks so nice! Pizza Wontons now that IS a new one!! They look so good and easy to make also inexpensive!!! This is a must try!! Minus the green peppers, I would love these. so many variations to try…..I’d get hooked! These look great. 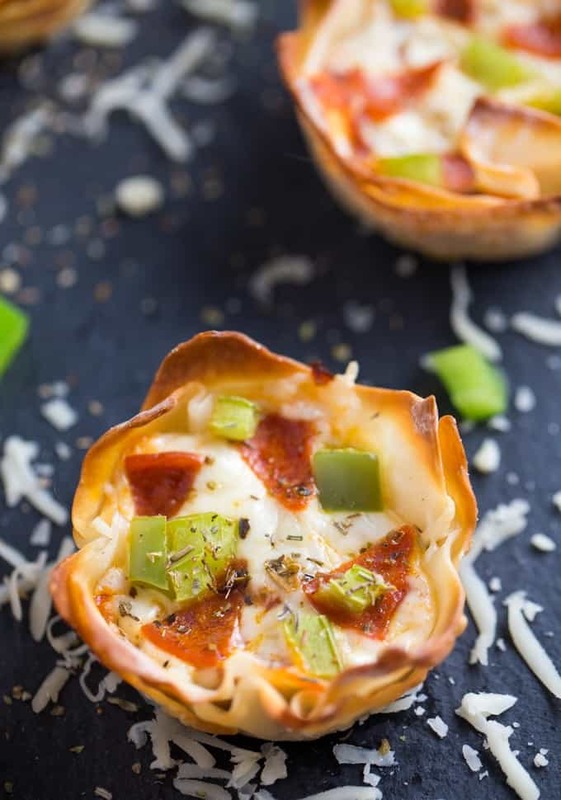 I like the idea of little pizza cups. Great appetizers. These look so good and perfect for a hockey or football party! I am pinning this one for sure, thanks! Yummo! My kids (and hubby) would love these for sure! What a great idea! I will have to try these, they look delicious! How fun! This would be such an awesome toddler meal, too! Oh I have got to try this! These look delicious and so easy to make. I’m loving this idea! We always have some wrappers leftover after making wontons, and this sounds like a wonderful way to use them instead of putting them back in the freezer to dry out! I love doing fun things with wonton wrappers – they are so easy! 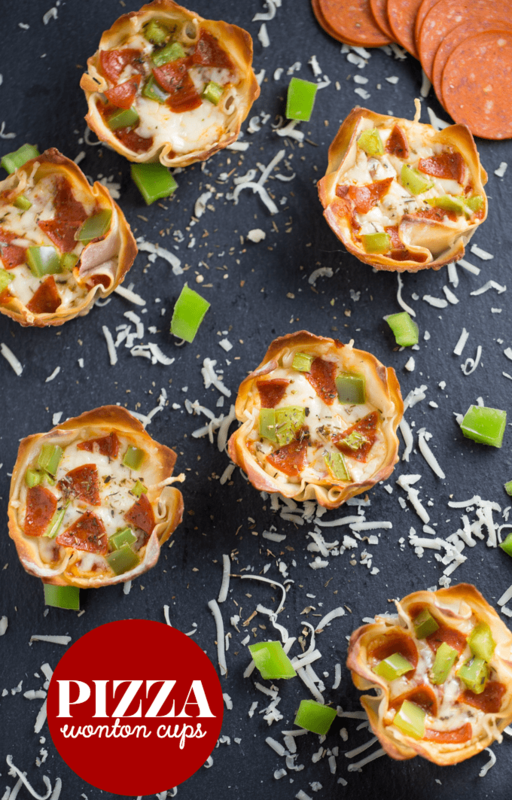 And I love these mini pizza bites – perfect handheld party treat 🙂 And I know my little ones would love these! This is such an awesome idea! Sounds delicious. Oh those look good!! Pinned! Thanks for sharing! Those look amazing, I need to find wonton wrappers at my local grocer…..now! I have to have make this. Thanks so much for joining the Dishing It & Digging It Link Party. Hi Stacie. 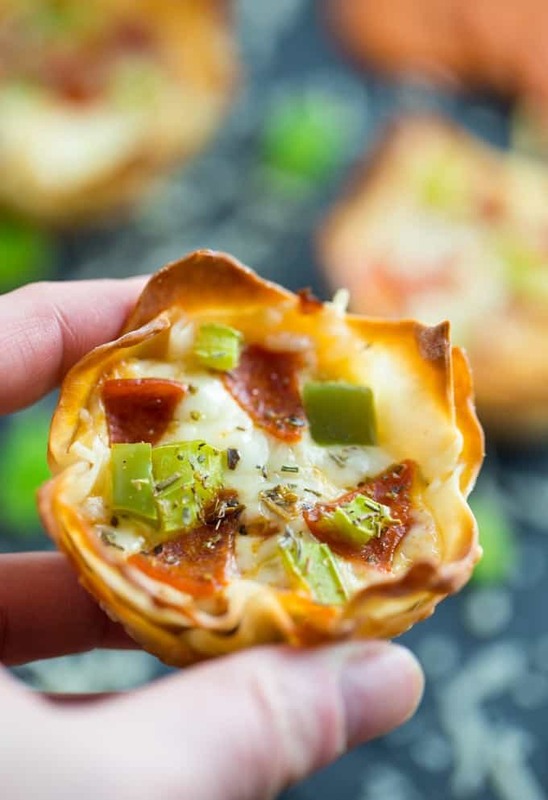 I love the idea of mini wonton pizzas; however, I have to really watch my carb intake, and at 4.5 carbs per wonton, I would really have to limit myself. 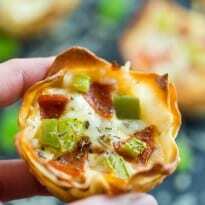 Do you think it is possible to make these using one wonton per pizza? Thanks. You could try and see how it goes! I think it would be fine though just a bit thinner than mine.